Moving a collection of platforms and content from different sources into a single robust content hub feeding five school websites plus a few micro sites. 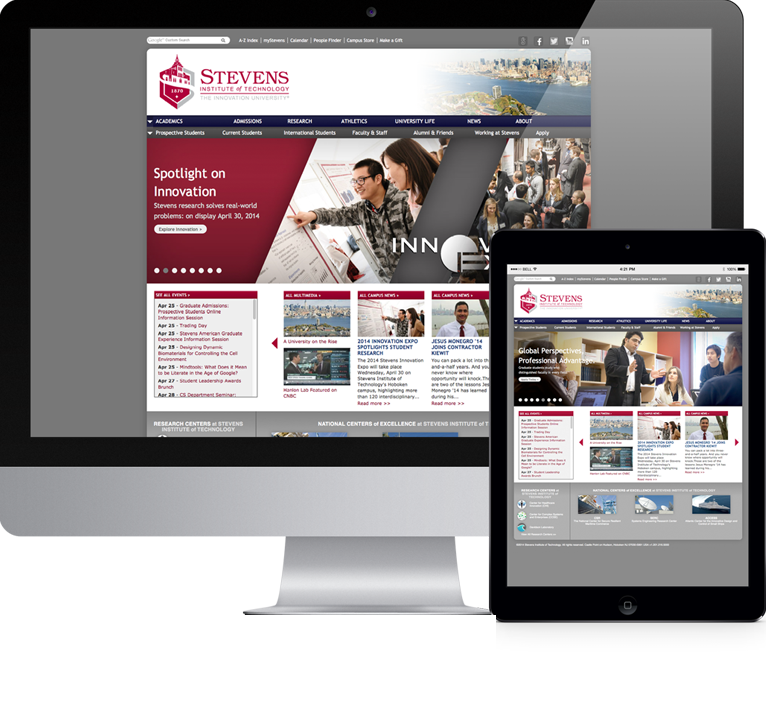 Stevens Institute of Technology had several websites for various departments and news content that they wanted to bring into Drupal. Some sites were static HTML with some differences in HTML structure and CSS selectors, which was a challenge for a migration such as this. They also had some dynamic websites that used the Typo3 CMS, Coldfusion, and legacy PHP applications. This was quite tricky since not every site used the same technology approach. Most used several platforms and there were some entrenched micro-sites. Stevens wanted multiple Drupal websites with a fresh and consistent responsive design. A main school site, several school websites, a few micro- sites, and a central news hub that feeds news, event, and multimedia content to the other websites. An enormous migration from their existing sites used the migrate module for a highly detailed migration, along with flatfish, which is a static HTML scraper that Drupal Connect developed in Ruby. Trekk was developed as a Drupal distribution, which standardized the structure and deployment for all the websites. Each site has its own design template that are derived from a single theme for a consistent layout. URL remapping and SEO optimizations were also taken into account to ensure a smooth transition. Drupal Connect delivered six websites for the first phase, including the content hub and five school websites. The content hub also used an API - a coordinated development effort between Drupal Connect and SIT - that allowed access to a large pool of read-only legacy data outside of Drupal. Four additional websites were deployed in the second phase, which was significantly faster than phase one, where we laid most of the groundwork. Overall the project took a great deal of planning and effort, which resulted in a very successful outcome.